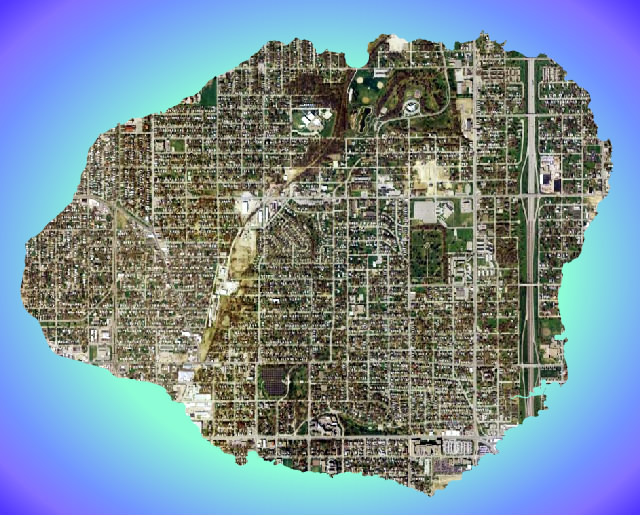 image above: Kauai with the suburbs of Omaha, Nebraska superimposed on it. This past week Kauai Mayor Bryan Baptiste released his plan for a moratorium on the subdivision of agricultural land. The goal is to halt the conversion of large tracts of farmland into suburban California style McMansions. Even at this late stage, the mayor should be congratulated for seeing the crisis we face with the loss of prime agricultural land. Baptste has been on the right side of some important issues during his tenure. In 2004 he fought for public access to Papa`a Bay Beach against Peter Guber's Mandalay Corp. The mayor lost but has been consistent in supporting public beach access and said, "The County is committed to taking the steps necessary to maintain public access to Papa'a Beach for the people of Kauai." In 2005 the mayor took a stand against gated communities on Kauai. He said "I envision our island with integrated communities where people of various socioeconomic levels and cultures can live together without gates or barriers that hinder access. In this island paradise, communities should be welcoming and accessible to everyone." In 2006 Baptiste offered his view on the two Waipouli developments that would have destroyed what is left of Kauai's Coconut Coast, saying. "As presented, I don’t think the two proposed Waipouli developments are good for Kauai". 1) As proposed in the plan, the thirteen current applications for agland subdivisions should not be exempted from the moratorium. These projects will have a big impact. The unfortunate fact is, much of the U.S. real estate investment market is crumbling. It is possible that the worst damage coming to Kauai is just getting into the pipeline now. If projects are wrong for Kauai, and don't have permits, they should not go forward. 2) We do need "Affordable" housing, but not on agland. "Affordable" is often a code word for "Suburban Sprawl". "Affordable Sprawl" is denser and will do even more damage to agland than the upscale McMansions. However, affordable housing for resident farmers could be excluded from the agland moratorium under strictly controlled conditions. Other affordable housing should be built in towns on on land zoned for residential use. 3) By definition a moratorium is a deliberate temporary delay of a planned activity. It is not a ban. It is not permanent. We might start with a moratorium, but the mayor needs to complete the next step and create a comprehensive plan that will preserve prime agland for our food independence and preserve the beauty of Kauai. It is quite obvious the world is at a crossroads. People everywhere are realizing that continuing on the path we have been on could lead to our destruction. There are too many of us burning up too much stuff. It is no accident that we face extinction as we reach peak oil consumption and record population levels. We need a general moratorium - a time-out to cool off. But that needs to be coordinated with a change in direction. We must conceive and create a world economy that does not require growth in population or increasing consumption to be viable. Nothing short of that will avoid a catastrophic collapse of our civilization. Recently, the business of America has been building suburban boxes and filling them up with "made in China" merchandise. But right now, the "big" problem with the U.S. economy is the meltdown of the suburban housing market. The housing lenders, builders and buyers are in a perfect storm of bad credit and bad financing. Yes, the problem will manifest itself later here than the mainland, but we should resist "building out" Kauai as the engine of our economy. It will only a serve the short term interest of a few, and leave less to love about Kauai. Let's have a moratorium on all residential suburban subdivisions tracts. Given the direction of energy prices and ongoing failure of the mainland credit market, we can no longer rely on tourism as the mainstay to our economy. Too many Americans are worried about their monthly mortgage payment. Someday soon we are going to have a lot of empty vacation condos and resort suites. We don't need to be building more. We need a moratorium on the visitor-timshare-condos and those concrete warehouse "resorts" with big pools, like the Waipouli Beach Resort in Kapaa. Creating an ethanol business may buy some time for Gay & Robinson (the last sugarcane operation on the island). For a short time it may preserve a way of life on the westside that combines some Hawaiian culture with the remains of the bankrupt sugar industry, but basically the ethanol plan is a boondoggle and cannot be characterized as a "green" industry or even a viable business. The justification for subsidizing this effort is produce our own energy. However, coal (in the form of coal oil) and sugarcane (in the form of molasses) will have to be imported to Kauai to sustain this operation. The ethanol Energy-Return-on-Energy-Invested is not good, and the resulting fuel will be at the expense of our topsoil and its runoff into the ocean. Reluctantly, I think we need a moratorium on the ethanol plant development. At all cost, we must avoid wasting our time and wasting the resources we will need to solve our problems. We must disinvest in operations that require fossil fuels and products manufactured faraway. In a place like Kauai, the quality of our lives is better when we not in our cars. To drive less we need to live near our town centers. New real estate investments should be made on existing lots, in our existing towns. Let's make Kauai towns worth living in. There is a need to distribute office work, now done in Lihue, to our outlying towns. This includes county and state employees as well as banking, insurance, legal, and financial activities. Let people work near or where they live. Retail shopping should be similarly distributed to reduce those trips that burn a gallon of gasoline to get a gallon of milk. We can do business with each other. Trade and service between Kauai residents is the best business. It builds wealth from what we have here on the island - and that wealth stays here. Overall, a local restaurant, using local produce is a better business for Kauai than a mainland franchise shipping processed food. Bartering systems can bolster a local economy. Here on Kauai there have been some efforts over the years. Recently a new website (http://kauaiabundance.com) began offering an abundance bulletin-board to enable giving away and trading homegrown produce. Local currencies are even more powerful. One of the best known is the currency of Ithaca, New York - the Ithaca HOUR (worth about $10 and redeemable for an hour's work). The world's largest local currency loan was been made by the Ithaca system. Alternatives Federal Credit Union received 3,000 Ithaca HOURS (worth $30,000), to pay for 5% of a building construction project. Visit www.ithacahours.com for more. We need more efforts like these that support the economic independence of Kauai. Kauai Coffee is already the largest coffee estate in America and popular in Japan. We need to reinvent our economy based on additional agricultural opportunities. Some are beginning to grow cacao, bamboo, ,neem , noni, awe, macadamia nuts and other cash crops that have a worldwide appeal and can be branded as from Kauai. In order so save our westside agricultural economy, Gay & Robinson might better grow hemp than sugarcane. Hemp is among one of the most productive and useful plants known. With hemp we can produce paper, clothes, textiles, building materials, food, medicine, paint, detergent, varnish, oil, ink, and fuel. Note: hemp oil is a more efficient bio-fuel than ethanol. Hemp can be grown in most locations and climates with only moderate water and fertilizer requirements. Where hemp is grown, it has become a valuable and environmentally friendly crop with a growth cycle of only 120 days. Farmers have reported excellent hemp growth on land that had been cultivated steadily for a hundred years. Drunkard: yeah, but I already ordered 13 double vodka martinis! Bartender: OK, but after that - Im going to have to cut you off.